In a couple of months, first Geoff Gannon then Whopper flashed the spotlight on Walmart. One looked at it in the 1970s, the other – in the 80s. Last year, I went back through the past 10 years. Today, I am going to put all of this together and paint, with a broad brush, the last 45 years of the company in celebration of Walmart’s 50th birthday. I may not be able to do justice to this master of compounding, so feel free to chime in. Investors are likely familiar with the story of the entrepreneurial super-merchandiser Sam Walton from Bentonville, Arkansas (originally from Kingfisher, Oklahoma, but had to move a lot during the Depression). Retailing was his calling and after leaving the military, he set out on an entrepreneurial path by purchasing a franchised variety store under the name Ben Franklin. Sam’s success made it look so easy that the landlord wanted the store for himself. Unable to renew the lease, Sam started opening new Ben Franklin franchises. On July 2, 1962, he opened the first Walmart store in Rogers, Arkansas, and the rest is history, as they say. 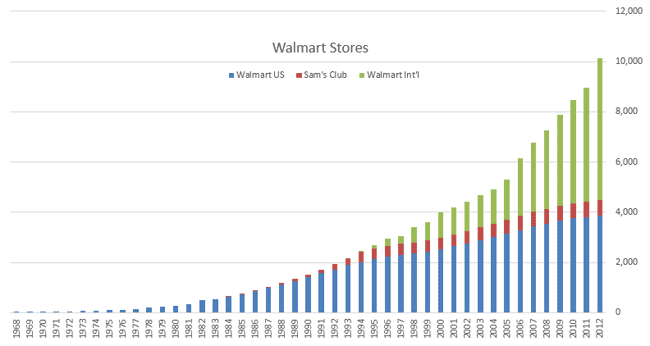 To say the most with the least, here is Walmart’s history in a few graphs. Wal-Mart Stores, Inc. was incorporated on October 31, 1969 and became a public company, trading on the Big Board, on October 1, 1970. The data I have used is from the annual reports published since then, all available on Walmart’s website. I have adjusted the numbers for inflation, using the changes in the CPI-U and 2011 as a base year. This is as close to exponential growth as you get in real life. 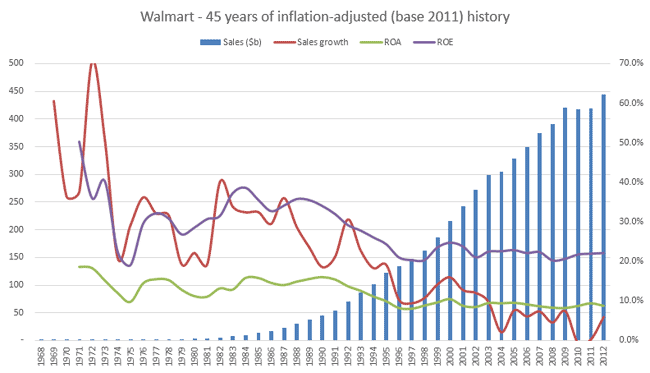 Walmart’s sales have grown at 21% annually, on average and adjusted for inflation, in the past 45 years. Book value has accumulated at the same rate. 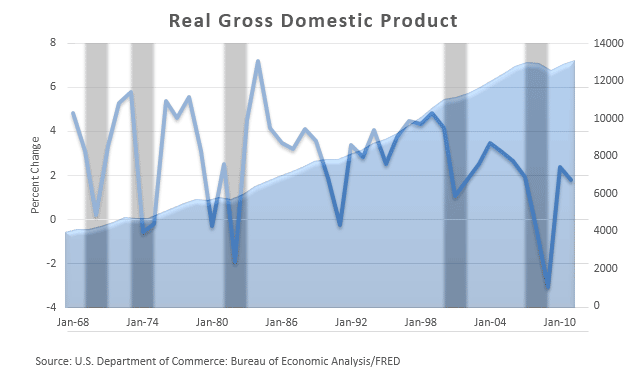 Naturally, growth (red line) has been continually declining. That’s unavoidable in a world where trees don’t grow to the sky. More importantly, this growth has been very rewarding to the owners of the capital. In the 1990 annual report, Walmart highlights 15 consecutive years of over 30% return on equity and similar increases in book value. 1968-1989: super growth – ROE averages 33%, ROA – 14%. 1990-1996: transitional period – returns move down to a lower, sustainable level. 1997-2012: stable period – ROE stabilizes around 20%, ROA – 9%. Apart from the company’s maturation, the decline in profitability has to do with Walmart’s expansion in warehouse clubs and to international markets. The number of Sam’s Club stores and international stores quadrupled over the transitional 1990-1996 period. Walmart US stores only doubled. This expansion was supported, to a large extent, with debt. The increased interest expense and the lower gross margins at the warehouse clubs were driving returns down. Additionally, Walmart was investing heavily in both its physical and IT infrastructure. This is a company that has been doing something right forever. Again, it appears that with the introduction of Sam’s Club (first in 1983) and with the growing number of international stores gross margins started shrinking, yet the blow was cushioned by operating efficiencies. It is amazing how stable operating profitability has been throughout this 45-year span. From growth to maturity, it has basically gone from 7% to 6%, with a maximum of 8.6% and a minimum of 5.4%. In the meantime, the US economy grew a bit over 3 times, at a pace of 2.7% annually. US population increased at 1% a year. In the heady 90s, Walmart was growing quickly its international operations. But most of its growth in the US, and its most explosive growth, happened precisely during those tough economic times depicted by the shaded areas. For me, this is another reminder that the macro view is not of much use to value investors. On all accounts, Walmart is a master of compounding. Next time, I will take a look at valuation.